FloPrompter Standard and Professional: Turn any PC into a studio-quality teleprompter! We regret to inform you that FloPrompter, one of the most innovative teleprompters for PCs on the market, is being discontinued effective immediately. With Microsoft’s transition to Windows 8 a few months away (expected Fall 2012), we have decided not to invest the significant resources necessary to migrate FloPrompter to the new Metro design. To all of our customers, we offer our deepest gratitude! It has been an amazing experience hearing all of the very cool things you’ve done with FloPrompter over the years. It was with great sadness that we reached this decision. Upgrading from Windows XP or Vista to Windows 7? No problem! We’ve recently been getting a growing number of calls from people who are upgrading their computers from Windows XP or Vista to Microsoft’s new Windows 7. Congratulations! So we thought we should share a few of the common questions these folks have to assist with the process. Q: Does FloSpace FloPrompter work on Windows 7? A: Yes, it does! Our customers report that it’s working great on both 32- and 64-bit versions of Windows 7. Q: How do I get FloSpace FloPrompter for Windows 7? A: Simply go to the download page on FloSpace.com and click on the “Update” button. Run the FloPrompter Installer first. Then, run the Vista Patcher app. Q: I tried installing FloSpace FloPrompter from an old CD (or old installation file), but it’s not working. I get a strange error message. What can I do? A: Older versions of FloPrompter didn’t support Windows 7 very well (or not at all). First, uninstall FloPrompter. Then, download the latest version from the FloSpace.com web site. Install FloPrompter first, then run the Vista Patcher app. 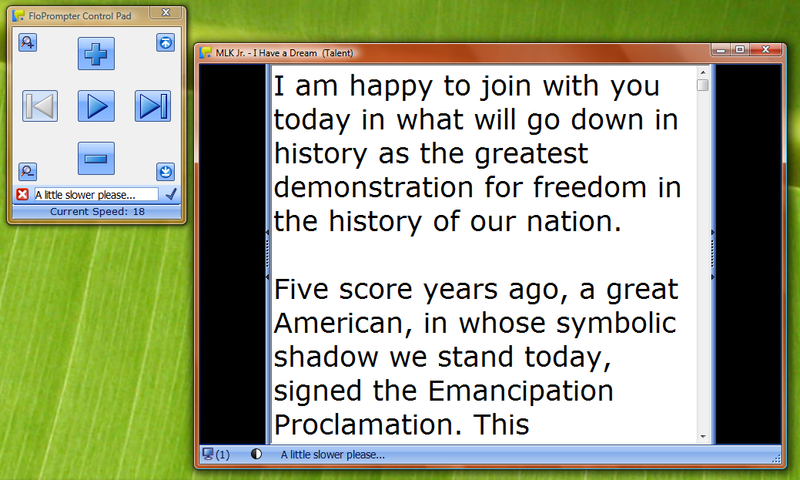 FloPrompter v. 3.1 or later works great on Windows 7. Q: When I install FloPrompter on my new Windows 7 computer, will I have to buy a new license or can I use my old license? A: If you’re simply replacing your old computer, it’s no problem! Please re-enter your license key into the license request dialog, and you’re all set. Comments Off on Upgrading from Windows XP or Vista to Windows 7? No problem! Many thanks to the testers who bravely gave the early FloPrompter 3.1 betas a go! Support for Windows Vista 64-bit version! Support for Windows 7 in both 32- and 64-bit versions! FloPrompter Professional Edition: A cool new “Talent Messaging” feature. Imagine a setup with a director in a control booth and a voice talent in a separate sound booth reading from the FloPrompter Talent Window. The director can hear the voice talent speaking, but sometimes it wouldn’t be wise to send voice commands into the sound booth. Now, the director in the control booth can type a message in the FloPrompter Control Pad Window and see it appear on the bottom bar of the Talent Window. See the screen shot below. First, run the FloPrompter installer. If your computer is running any version of Windows Vista or Windows 7, please also run the Vista Patcher app. And of course, this software update is FREE to all customers. Enjoy! Just a quick note to let you know that we updated the beta program for testing FloPrompter’s support for Microsoft Windows Vista 64-bit computers today. Would you like to participate in this beta program? If you are interested, please contact Customer Support and we’ll send you instructions on downloading the FloPrompter 3.1 BETA installer. A cool new “Message Talent” feature where the person in the control room can send a one-way chat message to be displayed on the Talent’s window. So if you own a Microsoft Windows Vista computer running the 64-bit version of the OS, contact us today: support@flospace.com! Kicking off FloPrompter 3.1 BETA Program Today! We have some good news! Today we are launching a beta program to test FloPrompter’s support for Microsoft Windows Vista 64-bit computers. * A cool new “Message Talent” feature where the person in the control room can send a one-way chat message to be displayed on the Talent’s window. Comments Off on Kicking off FloPrompter 3.1 BETA Program Today! Seeking Beta Testers for ‘FloPrompter 64’! It’s taken a little while, but we’re putting the finishing touches on a version of FloPrompter that will work great on 64-bit Windows Vista computers. Now we’re looking for a few hardy souls to give it a try and help us check that we’ve covered all of the bases. Our eternal gratitude! And for new customers, a hefty discount should you decide to make a purchase later. Thank you! We look forward to hearing from you soon if you’d like to be a beta tester! The official version number will be FloPrompter 3.1. Comments Off on Seeking Beta Testers for ‘FloPrompter 64’! First, the bad news: FloPrompter cannot currently run on computers running Windows Vista 64-bit. Now, the good news: We will be upgrading FloPrompter this summer to run on Vista 64-bit computers! 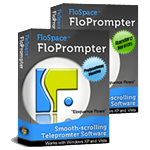 FloPrompter uses technologies from several other software companies to work its teleprompting magic. We’ll spare you the techno-mumbo jumbo. So let’s just say that because one of those software companies doesn’t currently support Vista 64-bit, the entire program won’t work. It’s most unfortunate. We’re delighted to share the news that the laggard software company just issued a new version that appears to work great on Vista 64-bit! So over the next few weeks, we’ll be updating all of the software components to the latest versions — especially that problematic one. We are currently expecting to issue the next update to FloPrompter sometime in early to mid-July. We’ll keep you posted! One of the hottest trends in K-12 education today is integrating media and broadcasting into curriculum benchmarks. Educators and administrators are learning techniques to broadcast lectures, school events, and student news programs live and from streaming sites like SchoolTube. To help add some excitement to the workshops, FloSpace is supplying five copies of FloPrompter, both Standard and Professional editions, to be given away to lucky attendees. We’re glad to support these workshops and excited to hear about all of the cool broadcasting and media activities students can engage in at schools now! Doesn’t it sound like fun? Prospective customers often ask us if we can offer an educational discount on FloPrompter for either Standard or Professional editions. The answer is most certainly yes! For Professional Edition: Please contact us for a quote. Can I get an educational version of FloPrompter on a CD-ROM? Yes for an additional fee of USD $5.00, but this option is only available with the P.O. and PayPal payment options. Even better – when you order a CD-ROM, we’ll include the license key as a file on the CD itself so you’ll never have to worry about losing it! How quickly can I get a license key? We offer an option for purchasing immediately with a credit card. Alternatively, if you would like to use a P.O., we’ll send you the license key(s) as soon as we receive your school’s P.O. (by email, fax, or postal mail). Yes, purchase orders are fine. Please send us an email (sales@flospace.com) for more information! ©2006-2008 FloSpace, Inc. "FloPrompter" and "Eloquence Flows" are trademarks of Flospace, Inc.